After going to bed around 10 am this morning.. I think it's safe to say that I really needed some sleep! So this is why the late update! But after a match like yesterday .. who wouldn't be drained? Ive uploaded around 300 photos? wow that can't be right.. to my imageshack.. you can take a look at them below along with some videos & headlines.. while I go back to bed & muster the strength we will all need for Rafa's match on Sunday! Rafael Nadal, who beat Roger Federer at the Australian Open on Thursday, says that reaching his 15th Grand Slam championship final is a fantastic way to the start the new season. "[To] start the season with the final here is a fantastic start and that gives me a lot of confidence," said World No. 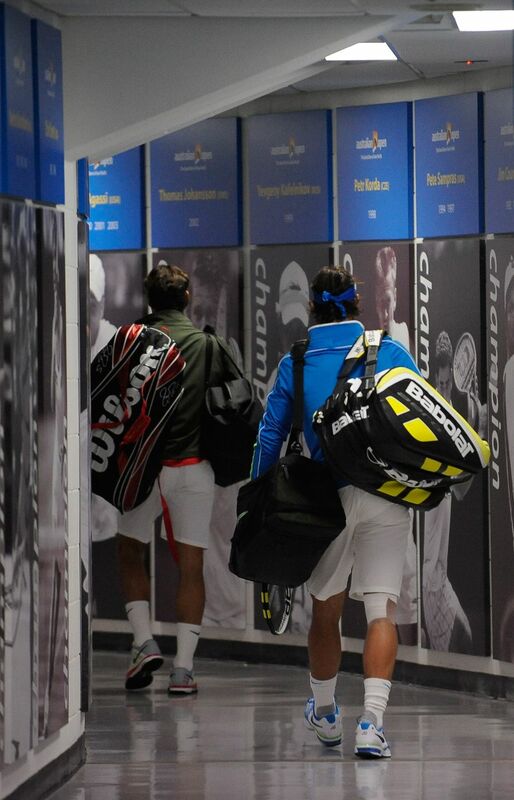 2 Nadal, who has now reached four straight major finals. "At the same time, [it] gives me confidence about how I [am] working. "I played not bad [in] the second half of the season in 2011. Not bad, but not very well. So I really need to win points to stay in the top positions of the [South African Airways ATP] Rankings."